There are many valuable reports that are automatically generated by your incoming sales calls. No more guessing on the responses generated by your advertising – now you know! CM Summary Extended version of the Calls Dashboard that provides more detailed information on call volume by hour and day of the week, average call duration, call status, etc. 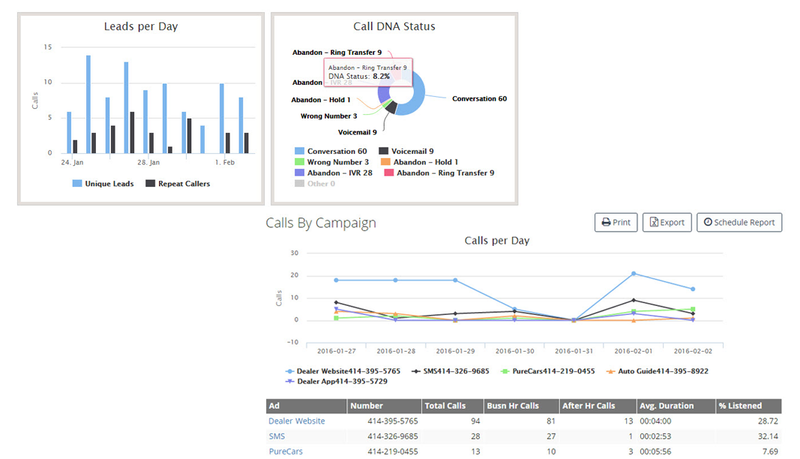 CM Calls By CampaignSelect individual campaigns that you would like to compare to see the total number of calls, as well as the number of calls both during and after business hours. CM By Callers Shows caller phone number, number of calls, and average call duration of the most frequent callers for the ad group and ad campaign that you select. CM Call Recording Every call generated from your advertising is stored within a Call Log in the reporting tool. Visual graphic of each call recognizes talk time for the caller as well as your staff, detects silence and ring time, and identifies the classification of the call. Search and filter parameters available to locate specific callers if desired, download or email audio files, and listen to every call from each party with just a click of the button.